Have you ever wondered how much yarn you have left to go in your skein? How about how much yarn you’ve used in your finished project? 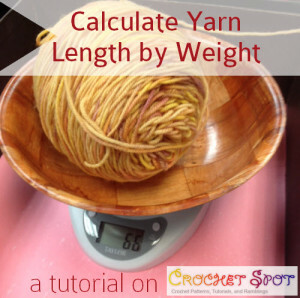 I didn’t realize this when I first started crocheting, but it is possible to know the length of yarn used or how much yarn is left in a skein without taking out a yard stick. All you need is some information and a kitchen scale. 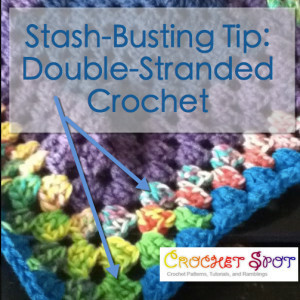 Stash Busting Tip: Double-Stranded Crochet! 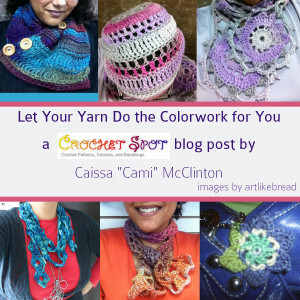 Let Your Yarn Do the Crochet Colorwork for You! I know I don’t have to convince you how wonderful it is to experiment with color in your crochet. The popularity of color changing is evident by just looking at all of the patterns with colorwork here on Crochet Spot, for example Amy’s newest baby bib pattern (check out the one in the middle!) Color enriches our lives and adds excitement to our projects. Previously I never thought of crocheting in variegated yarn as “colorwork” but that was before I really dug into the topic. Be fresh & colorful. Pin this. Have you ever noticed how some of your creations may not look and feel exactly how you imagined they would during or after creating them? 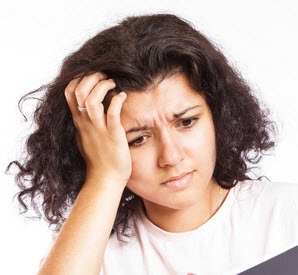 Or, have you ever noticed that your creations may not look exactly like the images used in the magazine or crochet article? Quite often, most crocheters from way back will use the yarn weight they have available to them at the time because it is cost effective and easily accessible. Perhaps, we may not even know about or use all of the yarn weights available, even if the patterns may call for a different yarn weight other than the most popular number four (4). Here, in this piece, I have decided to compile a very simple guide to the various yarn weights and what each of them can be used for when we’re creating our items this year. This will be excellent for those crocheters who like to create their own patterns. You can start to explore the various types of yarn weights to see what works with your creation. Now, I know this seems a little redundant, but it is not because there are so many ways to recycle yarn. There are many ways to get yarn in order to recycle it. I have seen so many people talking online about a variety of ways they recycle yarns. We’re not just talking about the yarn you already have at home like I talked about in previous posts, but other yarn resources. Let’s have some fun. Nothing’s really 100% foolproof, right? Crochet Spotters, I love you! Thank you! You’ve seen my worries about my yarn overload. 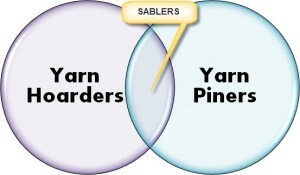 You’ve heard me fret about creeping toward SABLE (Stash Acquisition Beyond Life Expectancy). You’ve honored me with comments of support and commisseration. You’ve provided me with helpful tips. You’ve offered me alternative viewpoints that I’ve never before considered. And now a couple of weeks have passed and I have to put my stash down plan into print and into action. I hope you’ll join me, too. Do you see yourself in this diagram? Well, hopefully the following plan will help us all. Hey, you never know. The idea is to stash down, pay it forward, and have fun doing it. Are you ready? Let’s go! Crochet Spotters always come through. When I wrote last week’s post about having a seriously large stash, I wasn’t prepared for the wonderful flood of responses I would get. Thank you so much to Maryisidre, 1001knits, Doug, Melissa, and Kim Domingue, who made me feel not so alone! Crochet Stash Too Large? Is That Even a Thing? So here I am asking a question I never thought I would ask: Is it possible that I have too much yarn? What’s not to love, right? I bet a few of you are wondering if you even have an LYS and what it might be. Well, an LYS is a Local Yarn Store. An LYS can also be a crocheter’s best friend. In my last post, I talked a bit about my impromptu yarn crawl. Well, it was tons of fun, and that is partly because I was able to really get to know some local yarn stores. Isn’t it great that we have so many sources for yarn? As yarn crafters we are so lucky! We can shop everywhere from big box stores, to specialty stores, to yard sales and even at Goodwill! If you look long enough, you’re going to find yarn! But shopping at an LYS is really special for crocheters and I am going to give you three reasons why. 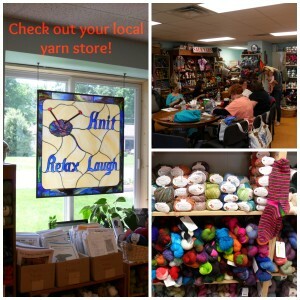 It’s Knitting Criations in Somers, CT!! What’s a Color Card? Why Would I Need One of Those? That sweater! You love it and you have to make one! When you feel motivation like this, you know that you’ll practice project monogamy and work on it and only it until you can wear it proudly. But since this is a significant investment of time and attention, you want to make SURE the final product is one that you’ll absolutely love. You need to KNOW that will be well worth the time, effort, and I’ll say it, MONEY that you’re about to put in. There is nothing worse than the following scenario: You’ve spent a lot of time thinking, comparing, asking for advice, and dreaming about your perfect yarn. You’ve excitedly selected it right down to the color that will perfectly compliment your wardrobe. You anticipate the package arriving at your doorstep, and eagerly tear into it to find that the COLOR of this yarn, this perfect, perfect yarn is just… not what you thought. Crestfallen. 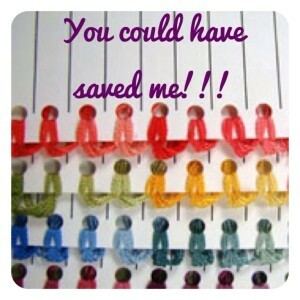 Actually, this did happen to a friend of mine, and this exactly why a color card can save your life!